If you use Qualtrics to collect survey responses, you can import the completed responses directly into your NVivo project. The imported data becomes a dataset file that you can sort, filter or auto code. On the Import tab, in the Survey group, click Qualtrics. The Qualtrics Authenticator dialog displays. Log in to Qualtrics. The way you log in depends on your Qualtrics account. If you have a personal Qualtrics account, or if your university or organization has set-up this configuration, you can log in with your email and password. If you're not sure what type of account you have, try this method first. If you receive an error message, try logging in with an API Token. If you usually access Qualtrics via a university or organization portal, you will probably need to use this method. This method involves going to the Qualtrics website and logging in to find the API Token for your account. The token is a unique string of characters which you copy and paste into the Qualtrics Authenticator dialog box. The token identifies your Qualtrics account and allows NVivo to access your surveys. You need to be connected to the internet to authenticate your Qualtrics account. Not all Qualtrics accounts allow NVivo permission to access surveys. If you close NVivo, you will need to enter the username and password (or API Token) again next time you import from Qualtrics. NVivo does not store your Qualtrics credentials anywhere in your project or on your computer. If you cannot log in to your Qualtrics account from NVivo, you can export your Qualtrics survey in CSV format then import into NVivo as a spreadsheet or text file. Note that this method is not as rich in functionality—you won't be able to merge additional responses on the same survey, and you should carefully review each question to ensure that NVivo is correctly recognizing closed and open-ended question types. 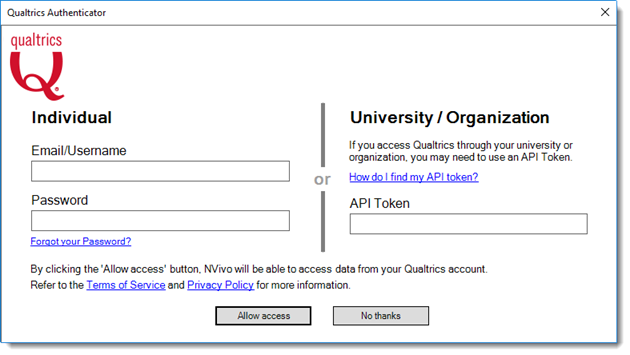 Access your Qualtrics account from NVivo. Follow the instructions in the Import from Qualtrics Wizard. If you receive a message indicating that the login webpage cannot be displayed, check your Internet connection. Responses that have changed in Qualtrics after you originally imported them are not updated in the dataset that you merge into.